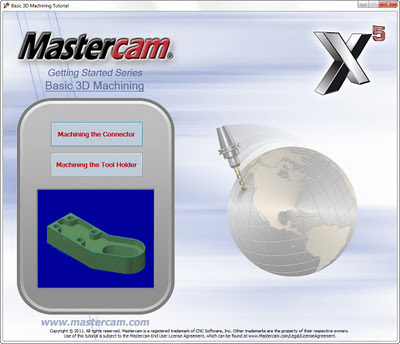 CNC Software has just released two new tutorials for Mastercam X5 – Basic 3D Design and Basic 3D Machining. In these two new interactive software, you will be learn how to draw the geometry and machine the 3D connector and tool parts (shown below). You must be comfortable using the Windows® operating system. Each lesson in the tutorial builds on the mastery of preceding lesson’s skills. We recommend that you complete them in order. Getting Started Series tutorials are available in an Adobe® Flash® compatible video format. Additional video tutorials may also be available. Contact your local Mastercam Reseller for more information. You must install Adobe Flash Player to display video tutorials. You can download Adobe Flash Player from www.adobe.com. The Basic 3D Design video tutorial covers 3D drawing with Mastercam. Before attempting this 3D tutorial, you must be familiar with the 2D techniques demonstrated in the 2D tutorial. Using construction planes in a 3D environment. Creating 3D geometry from 2D parts using translation and offsetting. Defining custom views using 3D Dynamic Planes. Using levels to organize 3D geometry. Using construction lines as reference geometry. The toolpaths created illustrate possible solutions for machining parts using 3D toolpaths – mainly surfacing operations. There are many solutions for machining these and similar parts. The goal of this tutorial is to provide the basic concepts for you to explore and expand upon. Toolpath creation is a repetitive, step-by-step process as demonstrated by this tutorial. Comprehensive and conceptual information can be found in the Help and other documentation installed with Mastercam. 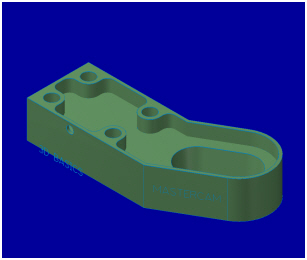 The Mastercam tutorial series is in continual development, and we will add modules as we complete them. 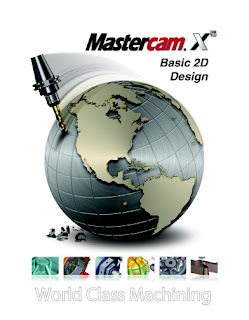 For information and availability, please contact your local Mastercam Reseller.